After popping the hood, Stevens was shocked to find Thomas, the stray cat she had taken in two years ago. "My stomach just hit the floor," wrote Stevens on Facebook. "[I was] crying like a baby because I felt so awful and guilty and worried for Thomas." Luckily, Stevens was able to pull Thomas from his perilous perch unharmed, but her story and others like it highlight an invisible danger to our feline friends during winter months. "Cats seeking warmth have been known to crawl into engine compartments in cars that have recently been driven," Dane County Humane Society spokesperson Gayle Viney told the Capital Times in 2009. "This can be fatal to the cat if the car is started." Above all, keeping your cat inside is the best way to protect him from his own curiosity, but if that's not possible or you live in an area with other outdoor cats, the American Veterinary Medical Association (AVMA) has one simple tip for keeping heat-seeking felines safe. "Make some noise," writes the AVMA. "Check underneath your car, bang on the hood and honk the horn before starting the engine to encourage feline hitchhikers to abandon their roost." Thomas, by the way, is doing just fine and looking for a new home farther away from the dangers of the city. "He grew up in the country," Stevens told news station KREM. "I think he really likes out buildings which is the reason why he might have ended up in my vehicle." 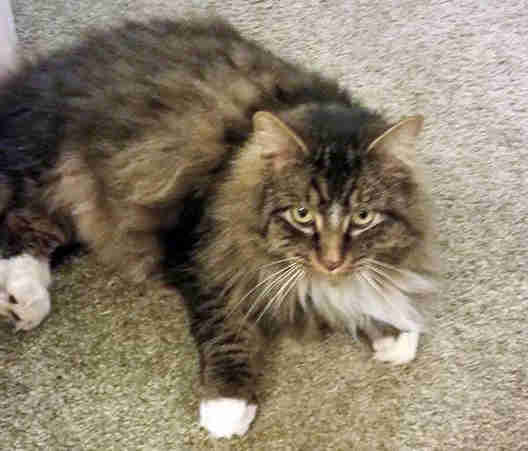 If you're interested in adopting Thomas, visit Stevens' Facebook page here. Or, to learn more about winter pet safety, visit the AVMA's website here.